Iretiola Olusola Ayinke Doyle is a bundle of talents. She is an actress, a presenter, a producer and script writer all rolled into one. In this interview with KIKELOMO ATANDA-OWO, she talks about how to bring Nollywood to the standard of Hollywood; how she got hooked to the man she was working under and how she accidentally became a presenter. My name is Iretiola Olushola Ayinke Doyle. I'm from Ondo State; Akure to be precise. I'm a wife, a mother, an actress, a writer, a producer, a presenter. At the age of two my parents went to America, so my early education was done there in Boston. I came back when I was 11 years old, went to Christ School, Ado Ekiti - primary and secondary school. Left in form three, finished from Apostlic Church Grammar School and had a degree in Theater Arts from University Of Jos. For several years, I was the only child because my eldest sister wasn't living with us and my brother came seven years later. So, I enjoyed a lot being the only one. I had the best of everything. Education was sweet. I was raised pretty much independently, so it was fun. My brother came along, so the attention shifted. It was still fun and kind of strict. My parents were kind of disciplinarians. Getting away with nonsense wasn't easy. As a person, I'm regular. Pretty laid back, independent. I try not to take myself too seriously. I am a peace-loving person, I'm not used to talking about myself. I'm a regular girl. By mistake actually, I'm an actress. I always say this first and foremost, but I had the opportunity to work with the production company even while I was still in school. Also, I had an interest to learn behind the scenes when my production company was at the point when they were producing television programmes. A responsibility fell on me to produce and present a fashion show, I guess my boss who is now my husband saw or thought it was something I would be able to do, so I just got trained to do just that. If you were not a televison producer, actress, presenter what would you have been? I would have been in Public Relations. How do you feel working with your husband on set everyday? It has become the normal question. This is not the first time someone is asking me this. This is not the first time we've worked together. We have been running his business together. We had produced films together. We produced 'Oge' together. It's no big deal. It's not new for me. We've even had an opportunity of being co-anchors on someone else's show. It wasn't anything different. You are into acting, presenting, televison production, fashion etc? How do you sustain this diversity? They are not diverse; they are all under the umbrella called communication. I'm an actress who has been trained to be a very good broadcaster. Any good actress, if she puts her mind to it can be a good televison personality. What does it take to be a presenter? It's just to be engaging on television and have knowledge of what you are talking about. They are all inter-related. I produce a fashion show. I probably would have produced something else if I wanted to. Producing is the same, whether it's a television show, it's just the element that you bring to the table that is different but it's the same procedure. They are all inter-related. I produce a fashion show, fashion and glamour are not different, so it goes hand in hand. It's all the same. How do you merge all these with the responsibility of motherhood? In practical terms, I'm fortunate because I do work for myself. I've finished a breakfast show 'Today On STV' and I'm at home. So, in practical terms I have a schedule that allows me to be present. Is it difficult being into everything at all times? Yes, just make sure you have a support network. People who can be there for you. Just surround yourself with people that will help you when you need help. How did you meet your husband, Patrick Doyle? In the course of work. (laughs) We've had over ten years together. I mean I'm married to him, he's a good guy. The will to succeed; the will to be useful to myself, to people around me and the desire to leave a mark on the wall. I wanted something to say 'I was here'. What impression do you have about the Nigerian fashion system? It's vibrant; as vibrant as it has always been. We are very stylish. What is the boldest step you've taken in your career? Every step, every decision you make out of the ordinary is a bold one because you don't know what will happen. So you are taking a risk. Sometimes it's calculated, sometimes it's not. So, even getting up in the morning is a bold step. I'm not going to pin-point anyone. Even that, I don't take memories and experiences and categorise them as my happiest moment, saddest moment or my highest moment. I have lived a very interesting life. There are several high moments and there are several low moments. That is life, its ups and downs. What are the biggest challenges you've faced as a person? The day I had my children. The first day I had the picture of my face in a movie poster. There were several moments or several times I got nominated for an award. If you were given a chance in the movie industry, what would you change? I will first of all make sure everybody gets a training because if we are trained, if we all understand what we are supposed to be doing as individuals, we will have a clearer picture of how we can try to make one complete goal. So, I will insist on everybody getting trained. You just celebrated one year anniversary of 'Today On STV'. How would you say the programme has been so far and what are the plans for the future? So far, it's one year down the line on 'Today on STV'. It is well produced. The production manager goes to extreme lengths to get a good mix or guests. It is pretty successful, in one year it has become what I've been told, “A must watch”. A huge number of viewers, some level of advertisement. It's a success and hopefully, it will continue to grow. There's this thinking that the Nigerian movie industry is not up to standard. What do you think is the way forward? It's not just the Nigerian movie industry, nothing is working as it should. What do you think the government can do to meet up to Hollywood standard? W e s h o u l d go and g e t trained, go and find out what it is. If you are a producer, go and find out what a producer does, and how a producer should operate. Each and everyone should go and get an education on what the industry is and what an industry is and how it runs. Clear understanding on what role to play within that industry, set up structure based on proper information that you have. We don't have structure. How do we expect to build a system when you have not set up a proper structure. We need to go back to the drawing board. I don't know, the fear of failure. Failing at one particular thing. Like I said, if you are about to do something and your time is up and you find out you've not done much, and you fail. I don't know, that's that. 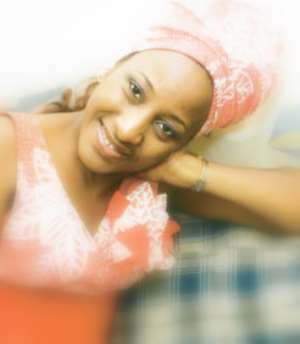 What does it take to become Ireti Doyle? Nothing. I advise everybody, don't become anybody. Why do people want to become somebody else? It's so boring. Be yourself! What does it take to live your kind of life, and do the things you do? Get a proper education. Make sure you speak well, it's not rocket science. If you want to come as knowledgeable, you have to put in the work. If you want to be a tailor, go and learn how to sew properly. Just put in the work and don't take yourself seriously. One person in the world you will leave Patrick Doyle for? (Laughs) Even if that person existed, I would not tell you. It's just a personal question (laughing). Should I tell you there's a man down the street I like? Of course not. I will not tell you, I take that very personal.